If you are in search of a Benton Harbor home, Harbor Shores can help, our Benton Harbor community features a wide variety of homes spread across our stellar neighborhoods. When you purchase a Harbor Shores Benton Harbor home, you gain more than a house, you become part of our community. We have combined the small-town charm with the year-round amenities of a world-class destination. When you are ready to find out more about our community, or homes please do not hesitate to call us at 269-932-1600 and speak with an experienced agent that will be able to answer any questions that you may have. Or please feel free to fill out the form found on this page, and we will contact you as soon as we can. The homes we offer are the perfect example of what you would expect from a premium Benton Harbor home. Some of our neighborhoods include Hideaway Cottages, Enclave, and Champions of Golf Villas. The homes within the communities are maintenance-free and have their own unique features. Tucked in the woods along the Paw Paw River, the Hideaway Cottages put a combination of nature, privacy, and convenience right at your doorstep. This kind of Benton Harbor home comes in four different floor plans that you can choose from that feature spacious open interiors. Here you will also enjoy a private river clubhouse, swimming pool, fire pit, and private kayak and canoe docks. Overlooking the 6th fairway of the Jack Nicklaus Signature Golf Course, the Enclave neighborhood consists of 6 total homes. Residents here can enjoy being close to the Paw Paw River and Lake Michigan is a short ride away. 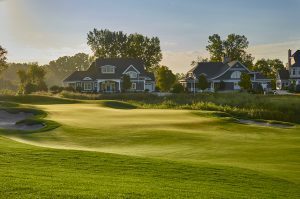 For the golf enthusiasts looking for a Benton Harbor home on a golf course, we offer the Champion Village gold villas. Some of their benefits include the ability to overlook the 1st hole of our award-winning Jack Nicklaus golf course, they also are walking distance of the Harbor Shores clubhouse, a world-class learning center with a dedicated short-game area. These villas bring to life the spirit of golf. All of our Harbor Shores neighborhoods have golf options, so tee time is not far away, and with access to our award-winning Jack Nicklaus golf course, the only thing holding you back from a second round is your schedule. To learn how to become a proud Benton Harbor Home owner, please call one of our agents at 269-932-1600. They will be able to discuss in detail all of your options when choosing your new home and answer any questions that you may have along the way. You can also fill out the form found on this page, and we will contact you shortly.